I can now reveal that in just three days, we managed to pack and box more than ONE THOUSAND WINTER KITS, exceeding our target. This means that one thousand vulnerable children will be warm next winter, thanks to YOU! Day 1: Today was amazing. The students really got stuck in and were enthused about helping us to achieve our goal, packing a minimum of 1000 winter kits. 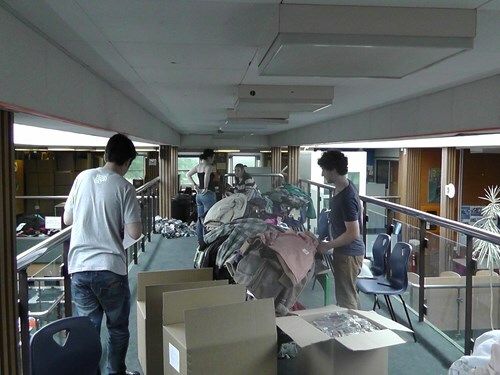 The first part of the day was spent sorting through the donations and gaining some kind of order. 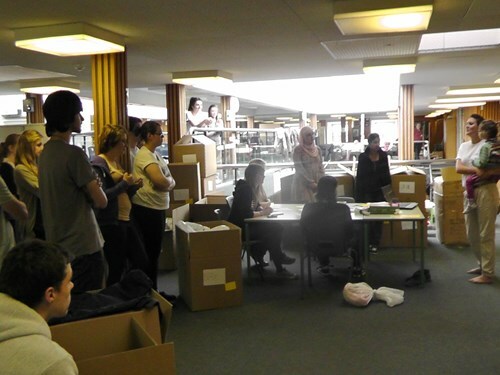 I was amazed at how speedily we managed to sort through the bags and boxes – MANY HANDS MAKE LIGHT WORK ! A bit of background music and a lot of organized chaos whilst the boxes were put together and stock was piled high. Some teams even managed to begin packing the winter kits! Thanks to Jackie Green & family for cutting and sewing hundreds of scarves…. amazing! A successful day. Day 2: Another industrious day today. Once they got into a rhythm, each team did a fantastic job of putting the packs together. Emma and her fantastic team steamed ahead, managing to pack record number of kits! Mrs Fyles with Leah & gang went to the launderette to wash the coats that needed some attention. Luke and ‘Harry Potter’ efficiently sorted all the boxes in preparation for the next stage (among MANY other things). Oliver, Dave and others tediously went through the discard room to salvage the warm but miscellaneous items to send along with the winter kits. We were short of scarves which held up the production lines (a learning curve for me), despite this, people still managed to stay focused and get a lot of packing done. Day 3: Utter exhaustion would be a good way to describe my current state, yet, at the same time, an enormous sense of achievement and pride in all those who have helped us turn our dream into a reality. It was wonderful to see the students arrive today, totally ready to get stuck in. Many began their jobs without any instruction and picked up where they left off yesterday. The newspaper photographer came by this morning to capture some shots of the students as they were in full flow. Luke Thornton, with his trusted clip board, did an amazing job of managing the final stages of the pack. A big shout out to Seb, who carried boxes at some unprecedented speed. Well done! Thanks to all the other strong box carriers who helped Brad to transport the finished boxes to be weighed and stored. Mrs Shakeshaft, thanks for the tea and all your help throughout the day. The Green family, you made HUNDREDS of scarves, absolutely amazing! One minor set-back today was discovering a few unexpected boxes in a side room needing to be packed. Thanks to some super speedy packers; Francesca, Ivana, Ryan, Emma, Aaron, Jess, Rachel, Lela, Chloe, Alex H, Charlotte, Cameron, Jack and the beautiful Anfas, WE DID IT! You guys were all absolutely amazing and we are totally grateful for all your help. Special thanks also to Alex Gharamani (AKA Harry Potter) and Luke for sticking around and supporting us until the bitter end. Karen Cookson (Greenlight Enterprise) came with her van to weigh the boxes and transport them to Big Yellow Storage ready for shipping. Throughout the day there were a lot of stickers, a stack of boxes and some very sweaty people (including me). However, all the hard work was definitely worthwhile! I can now reveal that in just three days, we managed to pack and box more than ONE THOUSAND WINTER KITS, exceeding our target. This means that one thousand vulnerable children will be warm next winter, thanks to YOU!